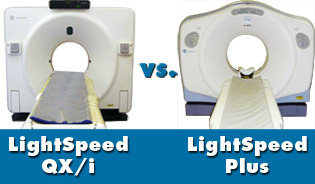 When comparing 4 Slice CT scanners the first question often asked is, "What's the difference between the LightSpeed QX/i and LightSpeed Plus?" In reality, the question being asking is, "What's the difference between an H1 Gantry and an H2 Gantry?" As you can see in the photo, the H1 Gantry (LightSpeed QX/i) is the less modern "Box" style, the same style that goes back as far as the HiSpeed Advantage series. The H2 Gantry (LightSpeed Plus) has the newer "Curved" style, which is now the same design used all the way up through the 16 and even 64 Slice LightSpeed series. However, when the description is a LightSpeed "QX/i" or LightSpeed "Plus" it is referring to a 4 slice scanner unless otherwise noted. Let's start by discussing what the LS QX/i and LS Plus have in common. Both scanners are Air Cooled (as are all GE CT Scanners), which means no chiller is needed. Both utilize the same X-ray tube, with a heat capacity of 6.3 MHU, have Solid State Detectors and 70 cm Bores. Either model can have an Xtream Console or Octane Console, but the newer Xtream console is more often found on a LS Plus unless the LS QX/i was refurbished after 2003. At the end of the day, there isn’t a clinical exam that can be done on the LS Plus that cannot be done on the LS QX/i. The biggest difference in technology between the LS QX/i and LS Plus is the rotation speed. The LS Plus can complete one Rotation (one 360 degree turn of the X-ray tube within the gantry) in 0.5 seconds, whereas the LS QX/i completes one Rotation in 0.7 seconds. A second difference between the two is the original date of manufacture. The LS QX/i's DOM generally ranges between 1998 - 2003 and the LS Plus between 2001 - 2005. The three differentiating factors (appearance, rotation speed and age) generally lead to a 20-40% increase in market value for the LS Plus versus the LS QX/i. We hope this is helpful as you determine which CT scanner is best for you and please don’t hesitate to contact us with your questions or to discuss your upcoming imaging projects. A special note to US buyers: make sure you look at NEMA standard XR-29 before you make your final CT scanner pick.